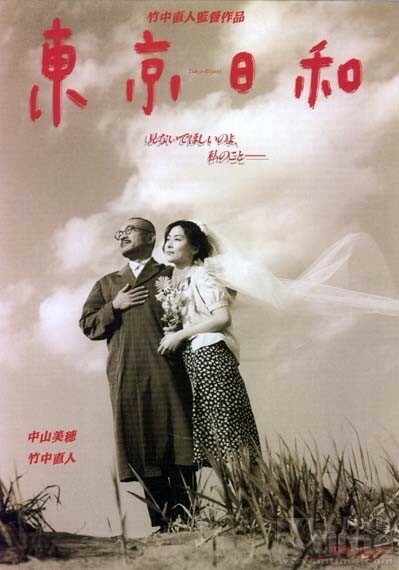 Following up on his critically acclaimed 119, Naoto Takenaka directs this portrait of a very passionate, though strange marriage loosely based on a book by renowned photographer Nobuyoshi Araki about his own deceased wife. Shimazu (played by Takenaka, the director) quits his job as ad agency photographer to go freelance. In order to pay the bills, his high-strung wife, Yoko (Miho Nakayama), takes a job at a travel agency answering phones. Yoko, however, is not your ordinary adoring housewife. When she confuses the name of a young editor (Takako Matsu) during a diner party, Yoko slides into a shame spiral resulting in one ugly marital spat before their increasingly embarrassed party guests. She disappears for three days, only to return with a young boy in tow. She plays bizarre games with the lad, including and especially dressing the child in girls clothing. In spite of her often baffling behavior -- including the loss of her job and a brief fling she had with rakish young man (Tadanobu Asano) -- she and Shimizu remain deeply in love. Later, the couple returns the remote Japanese-style inn, where the couple spent their honeymoon.